The Black Resource Center was born out of strong student advocacy and adamant demands. Though the existence of such a campus unit had been desired for years, a series of racially motivated events during the Winter Quarter of 2010 elevated the need for a campus space which would cultivate community and create sustainable support for the African and African American community. Student protests and demonstrations culminated in the establishment of the Black Resource Center. The Black Resource Center officially opened in late May 2013. 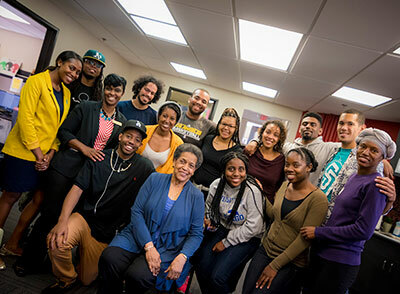 The Black Resource Center provides a supportive campus community space for the Black experience at UC San Diego. The BRC is committed to intra-community diversity and the development of the whole person. The BRC seeks to promote scholarship, foster leadership, and cultivate community for student success through the collaborative effort and support of faculty, staff, and the broader UC San Diego community. The Black Resource Center seeks to create and implement programs and services, while partnering cross-campus, to support the recruitment, retention and graduation of students. The BRC also seeks to provide a fulfilling and nurturing campus experience for all who self-identify within the African Diaspora and global Black context.